Finding a suitable girlfriend getaway is not the easiest task. First of all, you have not just your own taste and budget to satisfy but those of at least a few ladies and, second, finding a place to house a gaggle of gals in a way that is conducive to socializing is a challenge. So we bring to you the best girlfriend getaway options in Ontario, including the pros and cons of each. Indulge in spa treatments, hike, take fitness/yoga/relaxation classes, swim, and drink champagne in the hot tub. Laid back, a bit swanky, pampered, and people wander around in robes. St. Anne's is about 1½ hrs from Toronto in a rural location on 400 acres of scenic rolling countryside. Accommodation choices at St. Anne's include individual cottages with kitchenette, porch and common sitting area—a luxurious, private location with full-service dining and housekeeping. Bring your own wine to the dining room. No corkage fee. Overnight rates at St. Anne's are package deals and include 3 meals plus high tea—which is a lot of food (albeit delicious)—and an amount to be spent at the spa that is too much for one treatment, but not enough for two. The subdued atmosphere of people unwinding may not be conducive to raucous reminiscing and roars of laughter. Enjoy spa treatments, tennis, badminton, mountain bike (free rental), golf, pool, and volleyball. About 1½ hrs from Toronto on a sprawling lakeside location. ​Briars offers golf-course-side and waterfront lodges especially designed for get-togethers like a girls getaway. Private lodges feature up to 10 private guest rooms, each with its own en-suite bathroom and for socializing, a spacious living area, deck, and kitchen. Some rooms are in need of updating. Popular on the senior circuit—so not exactly a happening nightlife scene. Small outdoor swimming pool, smallish beachfront. Get spa treatments, both in-room or at the neighboring Le Scandinave outdoor plunge pool and spa. 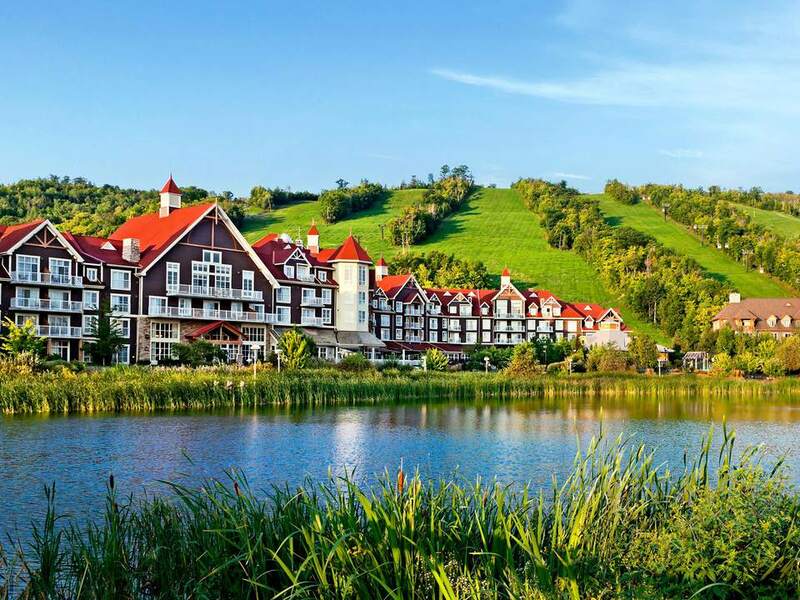 Enjoy shopping in the village and in the town of Collingwood or head out for adventure including mountain biking, golf, pool, ziplining, treetop adventure, and caving. Collingwood is 2 hrs northwest of Toronto between the shores of Georgian Bay and the Niagara Escarpment, including Blue Mountain, a ski hill and resort village. The Westin is part of this year-round, activity-filled environment. There are many suites to choose from that sleep between 4 and 10, with up to three bedrooms, pull-out couch, fully equipped kitchen, balcony dining, and living areas. Decent restaurant in the hotel and large deck area by the pool where groups can hang out. Lots of stuff to do, from sports to shopping, to accommodate diverse tastes within the group. Blue Mountain Village, which is outside of Collingwood's town center is a fabricated community of premium priced restaurants and shops. Though convenient and walkable, it lacks real variety. Indulge in spa treatments, hiking, yoga, personal development workshops, horseback riding, and snowshoeing. End the evenings for a long soak in the hot tub. New age, holistic, spiritual retreat. Remote and private location on the lake in Bancroft, about 2½ hrs north of Toronto. Quiet remote location on a motor-free lake. Grail Springs is primarily a retreat for healing and revival and not suited to a gaggle of wine-guzzling ladies. Food was delicious but sparse.